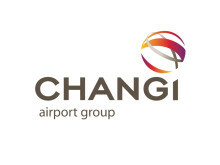 SINGAPORE, 28 February 2018 –Changi Airport Group (CAG) today announced that it will adjust the aeronautical fees for both passengers and airlines to help fund part of the Changi East development as well as the upgrading and refurbishment of existing terminal infrastructure and security facilities. The Passenger Service and Security Fee (PSSF) for all origin/ destination passengers departing from Singapore Changi Airport, presently S$27.90, will increase by S$2.50 per annum from July 2018. There will be no change in the PSSF levied on transfer/ transit passengers, who now pay S$6.00 when departing from Changi Airport. In the first year, the new PSSF of S$30.40 will apply to all air tickets issued from 1 July 2018, for travel until 31 March 2019. Subsequently, the PSSF will be adjusted annually on 1 April by S$2.50 over the next six years, with the last increase on 1 April 2024. This year marks the mid-point of the estimated construction phase of the Changi East project. Any subsequent adjustments will be announced only after a review then. Besides the adjustment to the PSSF, landing, parking and aerobridge (LPA) fees, applicable to all flights at Changi Airport, will increase by 1% on 1 July 2018. The LPA fees will then increase by 1% annually on 1 April for the next six years, with the last increase on 1 April 2024, when a review will be conducted. Under the regulatory regime, CAG has the flexibility to set the amounts for the various aeronautical charges for up to 2030, so long as the overall amount does not exceed the cap set by the Civil Aviation Authority of Singapore. This cap will be reviewed if the competitiveness of Singapore air hub is adversely impacted. Changi Airport has continued to register strong year-on-year growth, with 62.2 million passengers passing through its terminals in 2017, a record for the airport. Passenger traffic is expected to continue to grow, with demand for air travel in the Asia-Pacific region projected to triple over the next two decades. Passenger traffic at Changi Airport is forecast to grow at about 3% to 4% per annum over the next 20 years. Based on projections, Changi Airport’s handling capacity of 85 million passengers per annum is expected to be fully utilised by the late 2020s. Without further expansion, service standards may drop, with passengers experiencing delays. The expansion of Changi Airport is needed to provide for future capacity and to minimise congestion in its existing terminals. With Changi East, there is opportunity to capture a share of the growth in air travel in the region, to secure Singapore’s air hub status and ensure its continued competitiveness and relevance. A three-runway system, in which an existing military runway is being extended and accompanying taxiways are being constructed to allow for Changi Airport to operate with three runways. The third runway will be ready for civil aviation use by 2020, with the three-runway system to be operationalised in the early 2020s. A network of tunnels and systems to allow for the transfer of passengers, baggage and airside vehicles within Changi East and also between Changi East and the existing terminals. This includes the baggage handling system and automated people mover system. Terminal 5, which will allow Changi Airport to serve up to an additional 50 million passengers per annum in its initial phase and also provide 100 additional aircraft stands. This is scheduled for completion around 2030. The Changi East development is well underway, and payments will have to be made for contracts already awarded and works done during the entire construction period. Ongoing works include land preparation works, the development of a canal network to prevent flooding and paving works to extend Runway 3. An earlier adjustment in aeronautical fees will help to avoid a steep escalation of fees at a later stage. Funding for Changi East will come from three parties – the Singapore Government, CAG and airport users (including airlines and passengers). The Singapore Government will fund the majority of the project’s development cost. CAG has invested S$3.6 billion to date, and will commit a substantial portion of its reserves and future surpluses, including earnings from its airport concessions, to the development. In addition, CAG will take on a significant amount of debt to fund its contributions to Changi East. The adjustment to the aeronautical fees will also contribute to the upgrading and refurbishment of existing terminal infrastructure. Development works taking place at Changi Airport between now and 2024 include upgrading of the Skytrain system and the baggage handling system, as well as a revamp of Terminal 2. These improvements will alleviate congestion during peak hours and improve the airport experience for passengers. This period will also see the operationalisation of Changi Airport’s three-runway system that will reduce congestion in the airside, allowing for more flight movements in a safe and efficient manner. Even with the adjustment in aeronautical fees (including the introduction of the Airport Development Levy), Changi Airport will remain competitive compared to other international air hubs. The increases in the PSSF have been calibrated to be moderate and sustainable over the years. CAG will continue to work with and support airlines to ensure their growth at Changi. This commitment has been especially demonstrated during challenging periods in the past, when rebates on aeronautical fees were given to help airport partners navigate difficult operating conditions. CAG is committed to ensuring the continued growth and development of the Singapore air hub. To do so, it will have to build ahead to ensure that Changi Airport continues to have sufficient capacity to meet the region’s demand for air travel in the decades ahead. The Changi East development will allow Changi Airport and airlines to tap the region’s growing market potential and keep Singapore well-connected to key and emerging economic centres, and ultimately contribute to Singapore’s economic success. 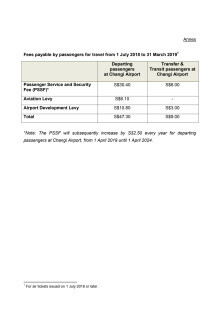 Passenger charges at Changi Airport include the Passenger Service Charge (PSC) and the Passenger Security Service Charge (PSSC). For simplicity, from 1 July 2018, the PSC and PSSC will be combined as the Passenger Service and Security Fee (PSSF). An origin/ destination passenger refers to a passenger who begins their trip from Changi Airport to another destination. The PSSF will continue to be collected by airlines, on behalf of CAG. The breakdown of fees payable by passengers departing from Changi Airport is in the Annex. This includes capacity from the expansion of Terminal 1. The Government will introduce a new Airport Development Levy (ADL), for passengers departing from Changi Airport from 1 July 2018, as announced today by the Ministry of Transport.